While scanning the hillside for other sugar maples along my usual morning walk, Mark and I discussed the possibility of planting some new maples for tapping later in our lives. The hillside I walk past daily is a perfect location for sugar maples --- a damp, north-facing spot --- and I suspect the only reason sugar maples aren't currently in residence is because the area was logged too recently for this semi-old-growth species to thrive in the young woods. But when I got home and did some research, I discovered that planted sugar maples won't be ready to tap for at least forty years. I consider myself a long-term thinker...but that's really long term (especially given current climate fluctuations and our location at the southern extreme of the sugar maple's range). Instead, I started wondering whether the intriguing experiments carried out at the Proctor Maple Research Center might not be a better avenue to explore. The scientists in charge have been experimenting with a high-density, pollarded maple operation and have found that you can harvest up to ten times as much sap per acre using high-density trees, with the initial harvest only seven years after planting. Now that sounds like something I'd like to try! The big negative about this high-density maple system from a backyard standpoint is that you have to use a vacuum system to get the sap out of the trees. Timothy Perkins of the Proctor Maple Research Center kindly wrote back to me within hours with answers to my numerous questions, and he noted: "Vacuum is REQUIRED. You will get almost no sap without it. In addition, the 'sap caps' are not commercially available. We are working with maple equipment manufacturers now, and expect there will be a product available for the 2017 sap season." I'm not too worried about the lack of commercial sap caps --- it looks like something we can easily cobble together --- and Mark suspects that we could also come up with a backyard-style vacuum system using a breast pump (like we'll be using on our goats) or a shop vac. Plus, I don't have to figure that out until 2022, so why not go ahead and plant now? So will we be planting high-density sugar maples this winter? I suspect Mark will talk me into setting aside at least one experimental row, but first I need to do some more research. "It would be best to plant high-sap sugar-content saplings," Perkins recommended...so now I need to do a bit more research and track down a source. First, I will cut back on my own use of sweeteners! Second, I resist technology to this extent, when we know that the ash-borer is also zooming in on maple trees. To set up research is good. But maple products, syrup and sugar, are rare for a purpose: not everything should be mass-produced! There are other sweet-sap trees, too: birch, for one. I do know that, with climate change, soon the rise of sap will be less dependable, unless in more northern zones. The old-time way, using horses, was right for the environment. 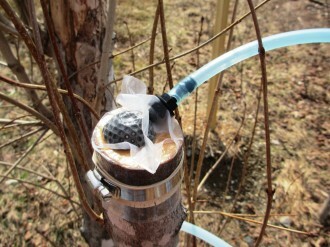 This new way will depend on an energy source to pump the sap. So, I am opposed. Mom --- I had an inkling you'd feel that way! And, on the one hand I agree with you. I suspect that there are lots of tracts of mature forest in New England that are protected solely because they act as a sugar bush and bring their owners income. I'd hate to see a different system put that situation into doubt. On the other hand, with the cat out of the bag, I'd say this could be a very sustainable method of producing new areas for sweetener production. From a sustainability standpoint, this method definitely beats cane sugar and is probably better than conventionally-raised honey too (no chemicals). For a small backyard hobbyist, it might be your only option if you don't want to wait 40 years for a new tree to be ready to tap. From the looks of the bags on top of the saplings, they're using a substantial amount of vacuum. Probably more than you would be able get from a breastfeeding pump. And given the long hoses and lots of connectors, you'll need a pump that can cope with a significant amount of leakage. For vacuum infusion of composites, we use oil-libricated rotary vane pumps that have a capacity of 25 normal m3/hour, and can get as low as 20 mbar absolute pressure. When doing resin infusion under a vacuum bag, our bags look like the bags on top of the saplings. Keep in mind that a vacuum pump needs a significant amount of power. From say 100 W for a 4 m³/h model to 750 W for a 25 m³/h model. They can be quite noisy, especially if not well maintained. While it's true that the average age of a true sugar maple (acer saccharum) when it crosses the 10" trunk diameter threshold is between 30 and 40 years, they aren't the only maples that will give you syrup! Some species, like Silver Maple and certain fast growing cultivars, can hit that point in just 10-12 years. These other varieties often don't have quite such a high sugar concentration, but if you've got a decent number of them, you can definitely start to tuck away a couple gallons of delicious each year, in less than 15 years.